Natural Gas Archives - Page 12 of 12 - Kase and Company, Inc.
Natural gas has finally showed some signs of life over the past few days in anticipation of tomorrow’s U.S. Energy Information Administration (EIA) Natural Gas Weekly Update. The short-term charts are showing that traders are anticipating a bullish EIA report, which would be the support the market needs to continue this upward correction. Keep in mind though, this is a correction, and it will likely be predominant in the winter month contracts and short-lived without continued support from external factors. After oscillating in a sideways range between approximately $2.79 and $3.00 for the past six trading sessions, the February futures contract rose above $3.00 on Wednesday. This is near the $3.176 to $2.783 midpoint of $2.98, which is significant because this is also in line with the 0.618 projection of the irregular wave $2.803 – 3.176 – 2.783. The $1.00 projection of this wave was overcome at $3.15, and the 1.618 projections is $3.38. 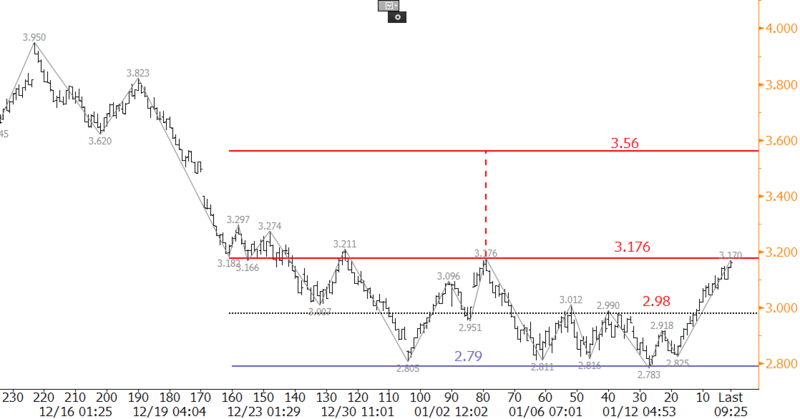 The $3.38 level is important because it is the 50 percent retracement from $3.95 to $2.783. This level will likely be met, and possibly overcome, upon a bullish EIA number tomorrow. In addition, February overcame the crucial $3.176 swing high, and a sustained close over this would confirm the recent bottoming formation (arguably a triple or even quadruple bottom). The projection for this formation is $3.56. Near-term support is $3.04 and then $2.94. These are the 38 percent and 62 percent retracements of the move up from $2.783 to $3.204 (swing high as of this analysis). These levels are also near the midpoint and open of today’s candlestick. A close back below $3.04 would call into question the validity of the move up. A close below $2.94 would negate the near-term positive tone altogether, and open the way for a continued decline. The long-term outlook for natural gas is bearish, but the move up over the past two days has shifted the near-term outlook to positive. A close over the $3.176 swing high today will open the way for an extended correction to $3.38 and possibly higher tomorrow. For more information about Kase’s weekly energy forecasts on natural gas and crude oil please visit our energy forecast page. The outlook for natural gas is negative, and without help from external factors the decline will likely continue. However, the market is hesitant to break support at $2.80 in the near-term, and is likely waiting on tomorrow’s U.S. Energy Information Administration (EIA) Natural Gas Weekly Update before it presses higher or continues to decline. Several positive technical factors indicate resistance will likely be tested before tomorrow’s EIA report. 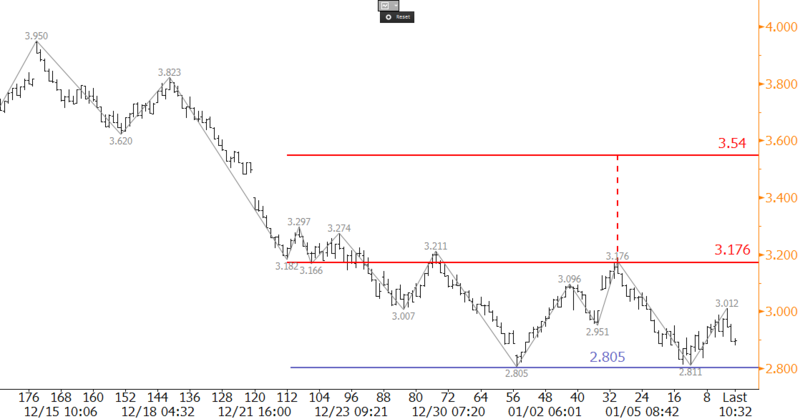 A small intraday double bottom formed at $2.805, as shown on the 120-minute equivalent Kase Bar chart. The confirmation point for the double bottom is $3.176, which is in line with the 1.00 projection for the wave $2.805 – 3.176 – 2.811. Immediate resistance is $3.04, the 0.618 projection. A move above $3.04 would call for $3.176 to be challenged, and a close over $3.176 would confirm the double bottom. This would then open the way for an extended correction to targets between $3.18 and the double bottom’s $3.54 target (calculation is 3.176 + (3.176 – 2.805) = 3.537). A move of this magnitude will not likely take place without major support from bullish external factors. Should $3.176 hold, the move down will likely extend. First support is $2.89, and a close below this would call for a key target at $2.79. This is the 0.618 projection for the wave $3.176 – 2.811 – 3.012. A close below $2.79 would negate the double bottom and open the way for targets in the mid $2s. Overall, the outlook is negative, and the move down is still favored. However, the double bottom, a daily morning star setup, and deeply oversold conditions, all indicate that a correction may take place very soon, and could be spurred by tomorrow’s EIA report. Visit the Kase Energy Forecasts Page to sign up for a free trial of Kase’s weekly energy forecasts on natural gas and crude oil. Kase’s senior analyst Dean Rogers reviews trade setups and price forecasts for e-mini S&P 500 and Natural Gas. To take a trial of our weekly natural gas forecast please visit the energy price forecasts page. Kase’s senior analyst Dean Rogers reviews trade setups and price forecasts for e-mini S&P 500, crude oil, natural gas, AAPL, and VIPS using Kase Outlook, Kase StatWare, and KaseX. This is the fourth of a four part series on Kase Wave Analysis. In this video Kase’s senior analyst, Dean Rogers, shows how the Kase Wave Analysis can be combined with other technical factors and indicators to make trading decisions. The Kase Commentaries on Crude Oil and on Natural Gas provide highly accurate weekly near term market outlooks. Kase’s analysis has proven to be remarkably accurate in identifying critical market turning points and probable market behavior.nnThe Commentary is highly technical, but interactive, so readers can click on unique words and phrases for definition to help them better understand the analysis. This is a great stand-alone product, but also works well as a companion product for Kase StatWare, KaseX or any of Kase’s Hedging Models.nnKase offers a free trial period for the Commentary so contact us today! Successful long term hedging requires logical decision-making. Hedgers need to understand the underlying structure of the market and longer-term behavior in order to find points that minimize the risk and maximize the results of a hedge plan. It is also important to find the best balance for your company between budget oriented goals and achieving better than market prices. The HedgeModel identifies these low risk points and can be custom tailored to whatever strategy is befitting your mixture of goals and risk tolerance. The HedgeModel is statistically based and does not require any previous trading experience to use. It is more-or-less mechanical and requires only 15 to 20 minutes per day to operate. It is data driven, so it works on any historic data stream in energy, including natural gas, crude oil, refined products, petrochemicals and crack spreads. The Natural Gas Hedge Report is a companion product to Kase’s HedgeModel that includes a forecast for the perpetual, three-, six- and twelve-month strips. It also includes recommendations on how to set hedging strategies for the forthcoming quarter, changes to the settings used by HedgeModel, low-risk hedge targets, recommendations on what instruments to use, a track record and mark to market of recommended strategies, and research results. Kase also performs ongoing research into market behavior and structure. Our research is oriented toward improving the results of our clients’ hedging strategies. In addition to a thorough evaluation of basis and correlation analysis, standard research in our quarterly Hedge Reports includes Monte Carlo simulations for estimating price distributions and objectives, statistical analysis of price and volatility, and cyclical behavior.